Louise Palazola of Memphis, Tennessee, widow of Paul Gudelsky (1963-1996), contacted André P. Larson, Director of the NMM, during the spring of 2004, to discuss the future of the D'Angelico/D'Aquisto/Gudelsky Workshop Collection that had been acquired by Paul and Louise from James L. D'Aquisto (with whom Paul had apprenticed in 1990). 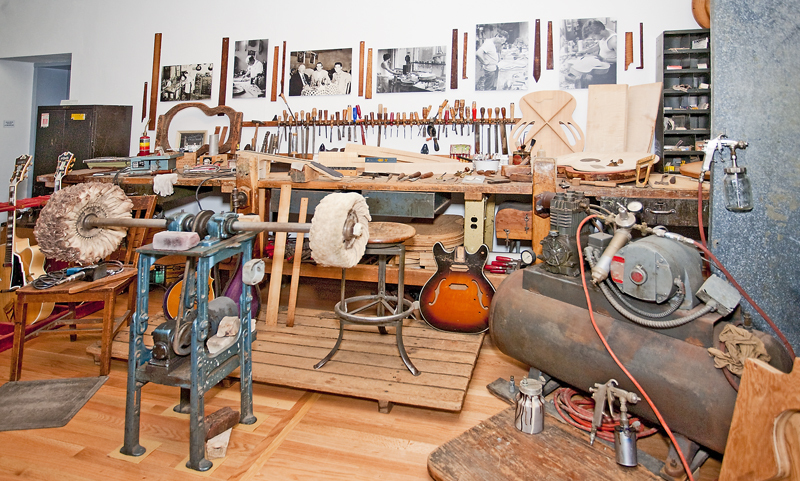 John D'Angelico (1905-1964) and James D'Aquisto (1935-1995) are widely recognized as the two greatest archtop guitar makers of the 20th century. 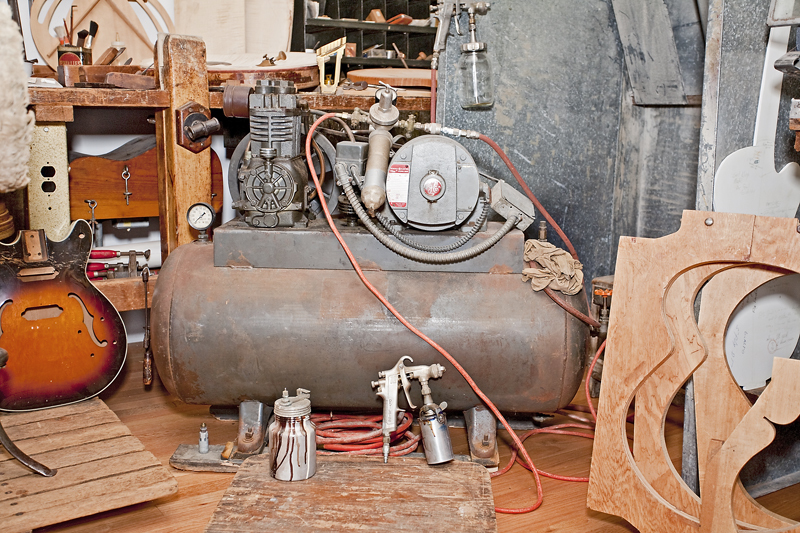 Late in November 2004, Larson and his wife, Kay, brought the workshop artifacts—donated to the NMM by Louise and Paul's father, Erwin Gudelsky—in a U-Haul truck from Vista, California, to Vermillion. 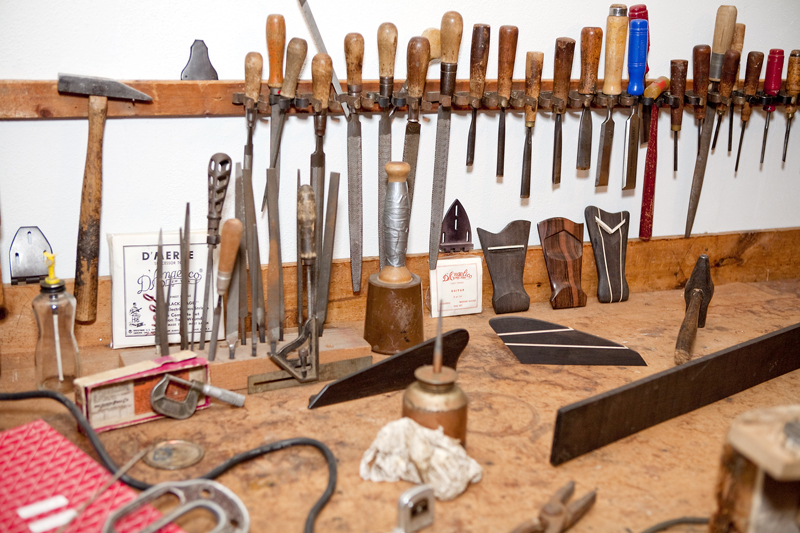 Included was the original D'Angelico workbench, tools, templates, ledger books, and other materials from the D'Angelico/D'Aquisto workshop in New York. 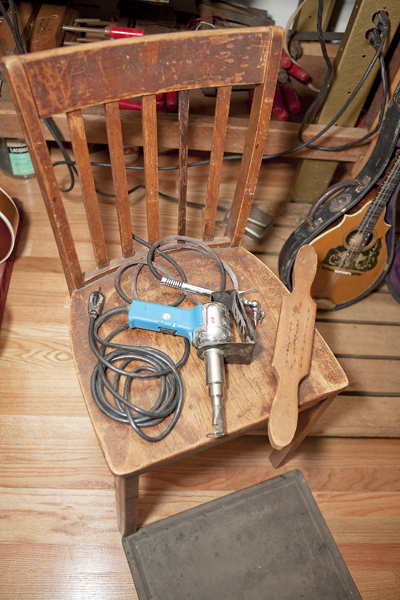 Additional items, including a second workbench, spray booth, drying stool, air compressor, the rack on which guitars waiting for adjustment were hung, and other items were acquired from D'Aquisto's son, James II. 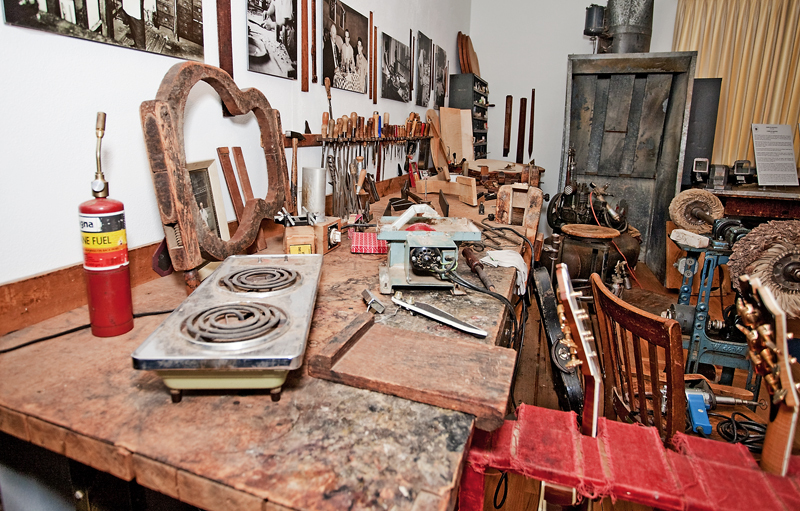 The D'Angelico/D'Aquisto workshop—moved several times during its years of active use—is now replicated at the NMM. 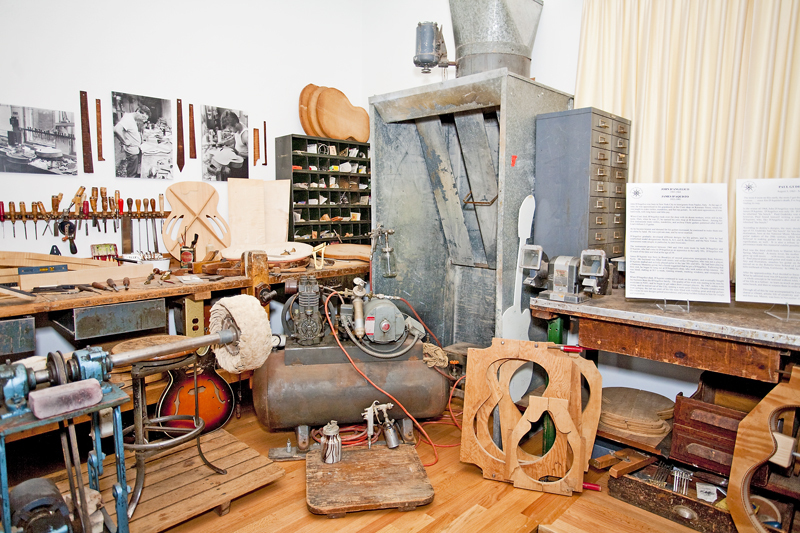 The workbenches, spray booth, guitar rack, tools, moulds, guitar backs, sides, tops, and all of the many other artifacts are all original and are given in memory of Paul Gudelsky by Louise Palazola and Erwin Gudelsky, the Tom & Cindy Lillibridge Fund, and the Tony and Bonnie Vinatieri Family Trust. John D'Angelico was born in New York City to immigrants from Naples, Italy. 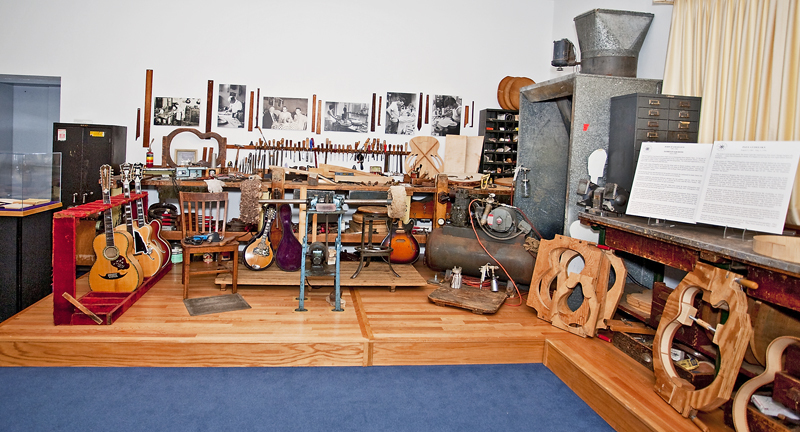 At the age of nine, he was apprenticed to his granduncle at the Ciani shop on Kenmare Street, where he was taught to make violins, mandolins, and flat-top guitars. As with most apprentices, it was hard work, with long hours and little pay. 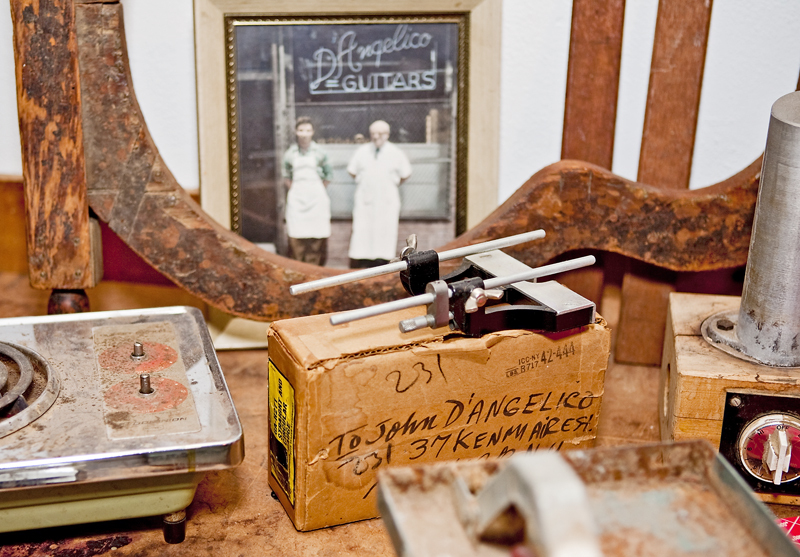 When Ciani died, D'Angelico took over the shop with its dozen workers, while still in his teens. Then, when he was 27, he opened his own shop at 40 Kenmare Street. Among his first instruments were violins, mandolins, and archtop f-hole guitars patterned after Lloyd Loar's Gibson L-5 guitar. 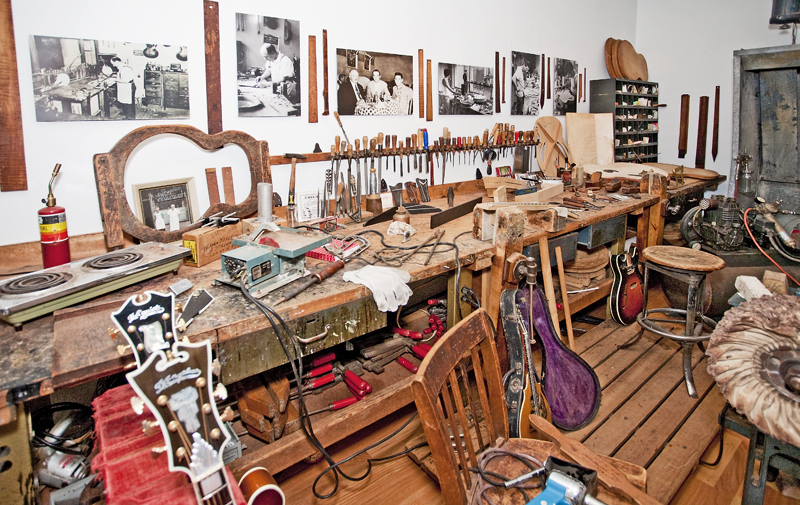 As he became known and demand for his guitars increased, he contined to make them one at a time by hand. He did not want to have a lot of people working for him. He was a private man, and he never married. 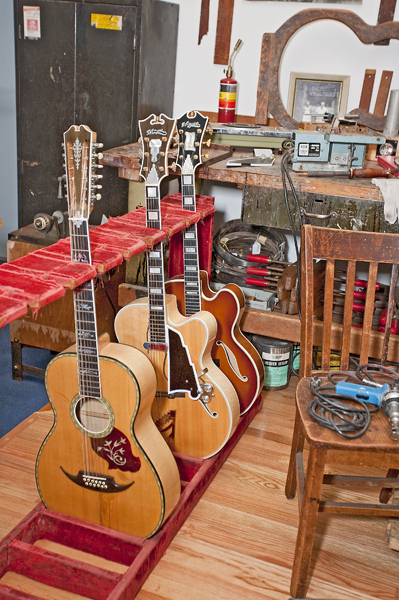 D'Angelico gradually developed different designs for his guitars, and by 1934 he had established model designations: Styles A, A-1, and B, the Excel, and the New Yorker. His instruments were sought, in particular, by jazz musicians. 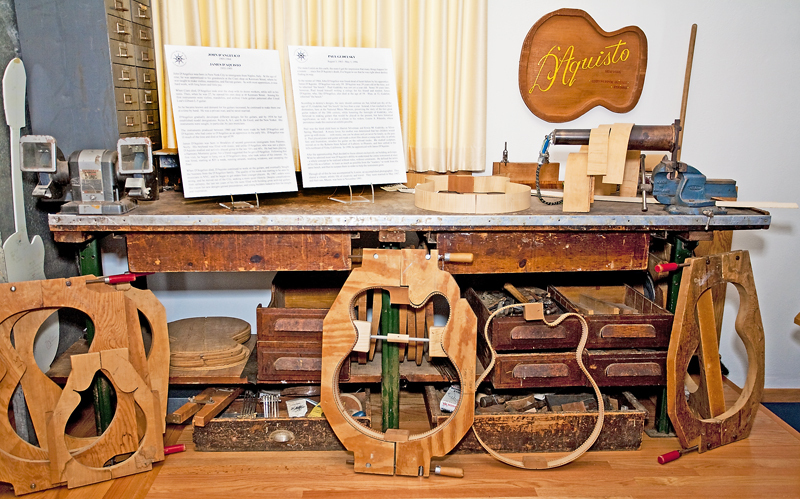 The instruments produced between 1960 and 1964 were made by both D'Angelico and D'Aquisto, who had come to D'Angelico as an apprentice in the early '50s. D'Angelico was ill much of the time and died at the age of 59. James D'Aquisto was born in Brooklyn of second generation immigrants from Palermo, Sicily. His boyhood was filled with music; and, unlike D'Angelico, who was not a player, D'Aquisto studied and actively played guitar in the late '50s and '60s. He had been playing a Harmony Monterey guitar, but a friend suggested that he get a D'Angelico. 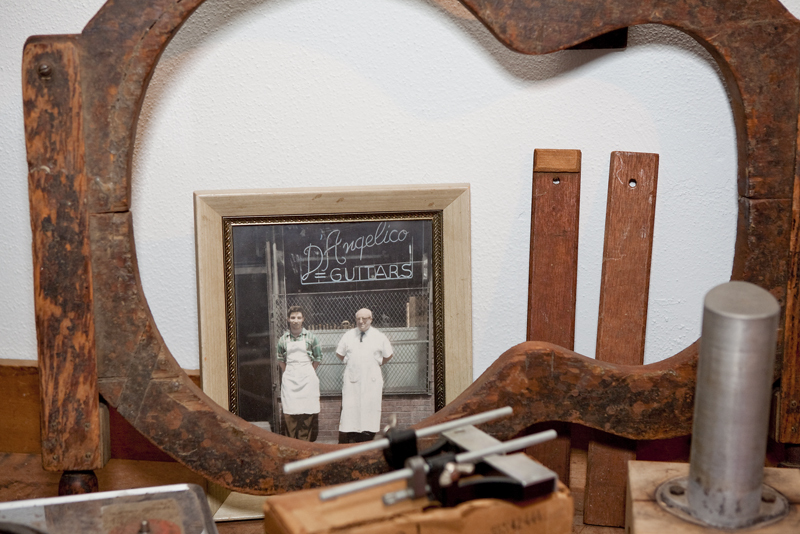 Following that first visit, he began to hang out at D'Angelico's shop, who took notice of his interest. He was hired, starting at $35 a week, running errands, washing windows, and sweeping the floor. 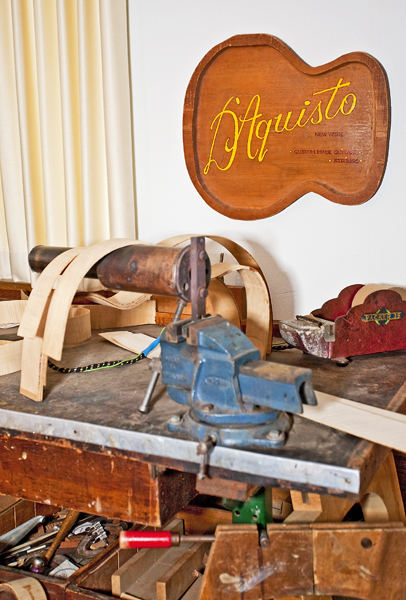 When D'Angelico died, D'Aquisto continued to work on the guitars, and eventually bought the business from the D'Angelico family. 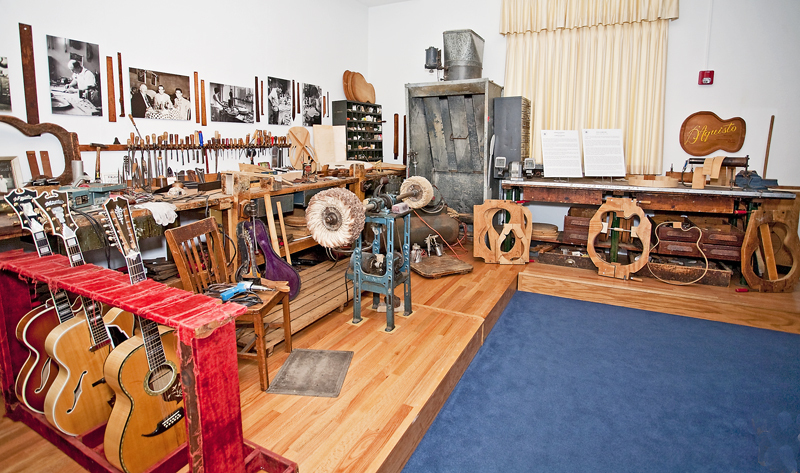 The quality of his work was starting to be seen by musicians in NYC, and he began to get orders from younger players. By 1967, orders were strong, and he moved out of the City, seeking a more quiet lifestyle. 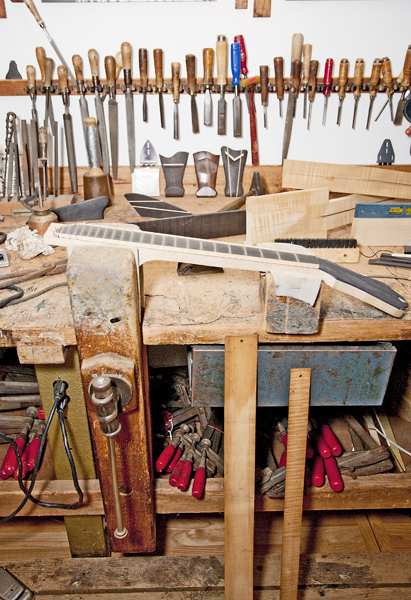 Despite complications from epilepsy, the last ten years of his life were filled with building great arch-top guitars. His vision for new designs gained precedence, and young builders looked to him for insight and inspiration. "The more I exist on this earth, the more I get the impression that many things happen for a reason . . . since Jim D'Aquisto's death, I've begun to see that he was right about destiny finding its way." In the winter of 1964, John D'Angelico was found dead of heart failure by his apprentice, James D'Aquisto. D'Angelico was only 59. D'Aquisto was 29 years old at the time, and he inherited "the bench." Paul Gudelsky was not yet a year old. Some 30 years later, however, Paul found himself writing a eulogy for his friend and mentor, James D'Aquisto, who, like D'Angelico, also died at the age of 59. Thus, at 32, Gudelsky inherited "the bench." According to destiny's designs, the story should continue on; but, killed just shy of the age of 33, Gudelsky had "the bench" for less than a year. 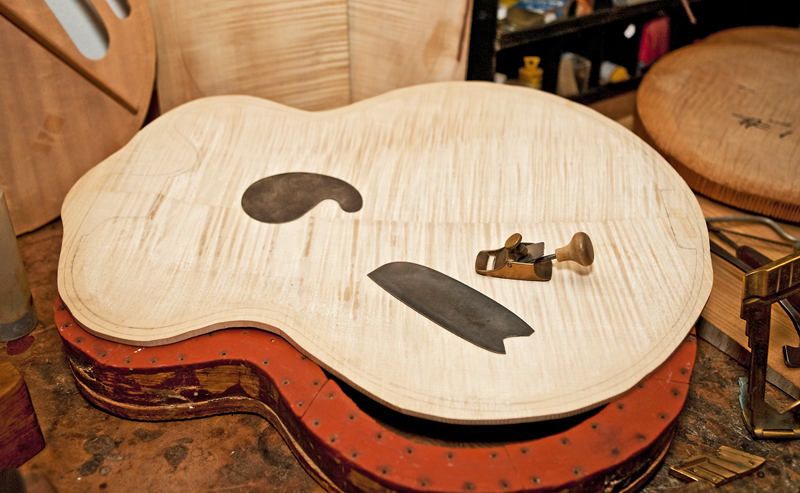 Instead, it has reached its final destination, here at the National Music Museum, preserving the story of the two great guitar makers of the 20th century, while honoring the foresight of Gudelsky, who believed in making guitars that would be played in the present, but have historical significance, as well. It is also a tribute to his widow, Louise A. Palazola, whose persistence made this memorial exhibit possible. Paul was the third child born to Harriet Silverman and Erwin M. Gudelsky in Silver Spring, Maryland. A music lover, his mother was determined that her children would grow up with music ". . . with music, one can be alone and yet never be lonely," as she puts it. Paul played piano and guitar and made a short film about a young man who, in artistic fury and frustration, smashes his guitar on the railroad tracks. 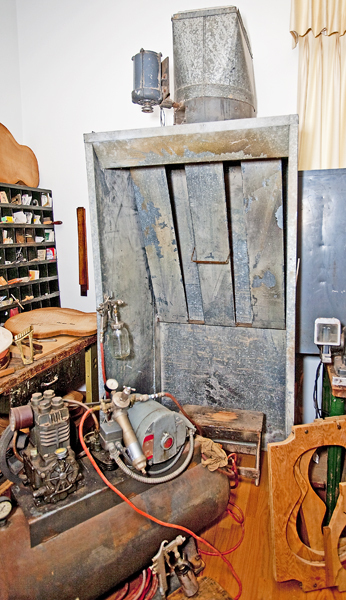 He studied sculpture, moved on to the Roberto-Venn School of Luthiery in Phoenix, and then settled in the hills northeast of Vista, California. In 1990, he apprenticed with James D'Aquisto. After the apprenticeship, Paul decided to focus almost exclusively on building arch-tops. 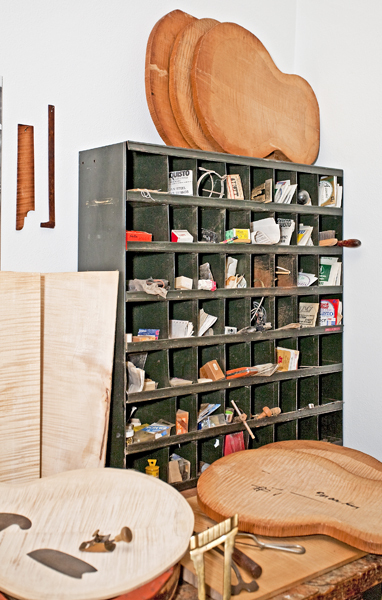 What he admired most was D'Aquisto's ability to understand the entire instrument at once—"a whole concept to be realized without rules, without constraints." 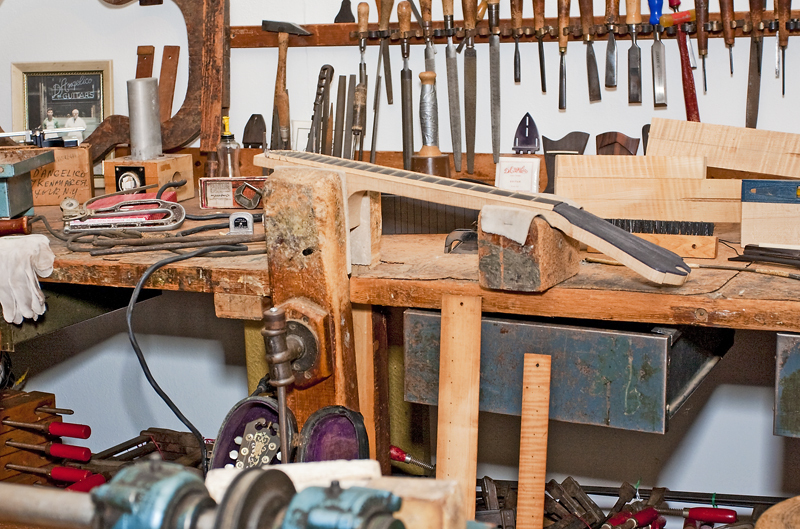 He defined the terms of his life as a luthier: to learn as much as possible from the "masters," to work from the same bench, and then to surpass them in order to help the instrument grow. Through all of this he was accompanied by Louise, an accomplished photographer. 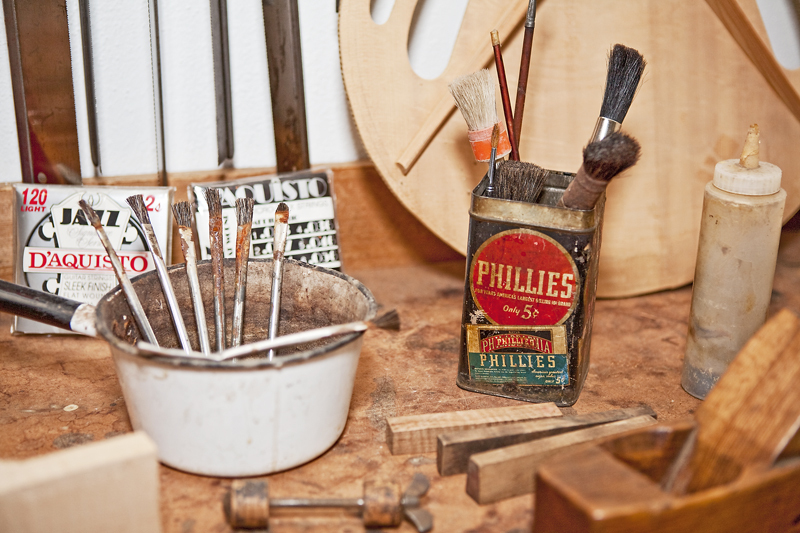 They shared a vibrant, artistic life of creativity and travel. They were married in May 1987, and their son, Mason, was born in November 1991.